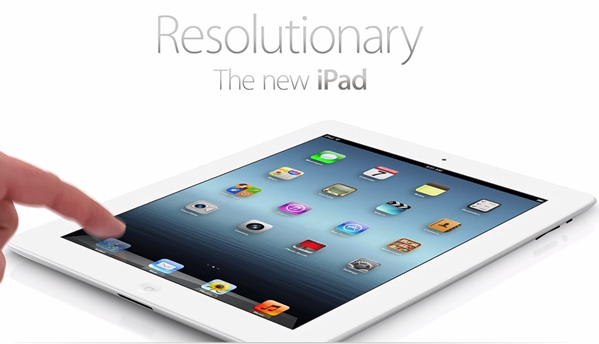 Top Retina Display Ready Apps For Your New iPad Which You Should Download Right Now! The new iPad has finally arrived, much to the excitement of the many who’ve been waiting anxiously since last Wednesday’s announcement. Seeing as the device now has a beautifully-crisp Retina display, the app makers have been hard at work updating their titles to take advantage of the increase in pixels. At 2048×1536, the clarity is now at an unbelievable level, improving the experience whether you’re a gamer, bookworm, or note-taker. We’ve compiled a list of some of the best apps and games for your new device — all of which have been up scaled for the Retina display. Having just been ported over to iPad, the OS X photo organizing, editing, printing and sharing app has also been optimized for the fruit company’s brand new tablet. 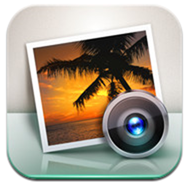 With a brand new iSight camera on the reverse of the device, the chances are, you’re going to need a decent accompanying app as opposed to the rather basic Photo album library. You can repair, saturate, desaturate, lighten, darken, sharpen, soften, and remove red-eye from your snaps, and at a very reasonable price of $4.99, this iOS remake comes highly recommended. Note-taking is one of the most commonly carried-out activities on tablet devices. The market for such apps is huge, with Penultimate and Notability being two of the most popular apps available for the iPad. As a measure of just how many there are competing for the attention of consumers, even Microsoft joined the party late last year, releasing an iOS version of its OneNote utility. 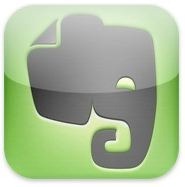 Free to download, Evernote is arguably the most popular option available. The free version is limited to 60 MB/month, while the premium service costs $5 per month or $45 per year. 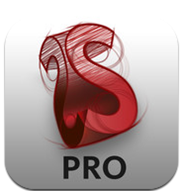 It comes with a bunch of useful features, allowing you to add text, audio, and images to the same note if you so wish. With a near 5-star rating from several thousand famously fickle App Store voters, you needn’t take our word for it, either. 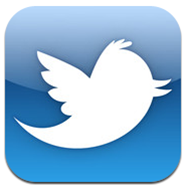 Tweetbot is the accepted People’s Champion when it comes to Tweeting on iOS. It’s much more polished than the official app, which often succumbs to bugs and crashes, and has only recently been ported through to the larger of Apple’s iDevices. With so much critical acclaim, it scarcely needs any introduction, but when an app is this good, we like to rave about it as much as we possibly can. The latest version, which costs $2.99, brings Streaming capabilities, improvements to the Tweetmarker service, as well as, of course, Retina graphics for the third-gen iPad. As a long-time user of this app on both iPhone and iPad, I would go as far as to say that no Twitter user should be without Tweetbot. 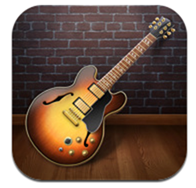 Like iPhoto, GarageBand is another app which started out as a Mac app. Since being released for iPad early last year, music fans have been busily producing their own tunes on-the-fly. Despite the third-gen device focusing heavily on the display and image-taking capabilities, that doesn’t mean that a Retina-optimized GarageBand should be overlooked. If you have enjoyed using it in your iPad for the last year, you’ll surely continue to enjoy arranging and mixing your songs with up to eight other tracks using Touch Instruments, audio recordings, and loops. Sharing is easy too, since you can email songs right from your iPad, as well as export your songs straight to the iTunes library on your Mac or PC. 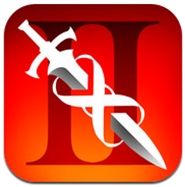 It costs $4.99, and you can download it right now from the App Store. The impressive trident of productivity apps have certainly been a winner, despite various attempts from third-party devs to dethrone Apple’s famous iWork Suite with a bunch of Office-like alternatives. Like GarageBand and iPhoto, it has been around on the Mac for a number of years, but is now used by the many iPad-owning PC users too, thanks to its ease of use and great set of feature. Consisting of Keynote, Pages and Numbers (Powerpoint, Word and Excel) to the Windows-tuned folk among you, it makes creating, saving editing and exporting documents extremely easy, and although the apps are priced at 10 bucks each, most would conclude that they are worth the money. You can download Keynote from here, Pages here, and Numbers here [App Store Links]. 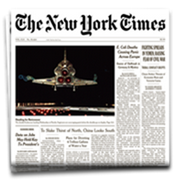 If you like to keep up-to date with the latest news, you’d be hard pushed to find a more respected source than the New York Times. Its iPad app is free of charge, and, like all the apps in our extensive list today, the user interface has been optimized for the new iPad’s Retina Display. Free to download, it costs $34.99 for full access, with the main perk being banishment of those dreaded ads. Created by AutoDesk – an omni-present market leader in professional design software, SketchBook Pro for iPad allows you to create some fantastic designs on your iPad. Although there are plenty of apps catering to the creative mind, most lack the professionalism and precision of SketchBook. If you have the finesse (and of course, an iPad), then this is a great choice for you to demonstrate it. 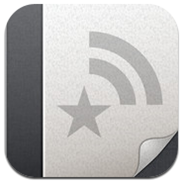 This great little RSS reader for iPad essentially rethinks Google Reader, adding a bunch of smart features rendering it the only such app you will ever need. Polished to the point where it slots in as if it were native, it’s powered by a highly customizable interface separating it from every other such app available for the device. The Retina graphics update is merely the tip of the iceberg; this app is – for lack of a more sophisticated phrase – the business! Due to the runaway superior graphics of both Real Racing and the sequel – strangely entitled Real Racing 2 – both titles have remained near the summit of the games charts ever since they were released onto the App Store. Then again, the Real Racing experience isn’t once to be taken merely at face value, and both games provide cutting-edge gameplay and a decent challenge in order to keep a gamer interested for more than half an hour. In iOS terms, these games are your Gran Turismo series – setting a high benchmark from which other publishers and developers are struggling to emulate. 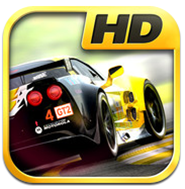 If you’re into your racing games, Real Racing 2 HD is the best; and with the sharp visuals now even sharper, you’ll surely be engrossed in what is quickly becoming a classic iOS title. 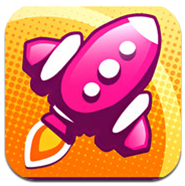 Flight Control – a simple concept which involved landing small planes on color coded runways in a candy land environment – became an early favorite among iOS users, particularly as Apple demoed the game throughout most of its iconic stores on both the iPad and iPhone. Creator Firemint Party has ditched the cheesy music and visuals (well, sort of), to create a similar experience but with a more spacey, rocket-themed edginess. The more it doesn’t sound as though it would be your type of game, the more I would encourage you to download it, as it is incredibly addictive. Ahh, finally – some physics, I hear you cry! 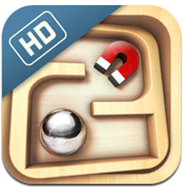 No list of iOS games would be complete without some form of physics-based puzzler, and Labyrinth is one of those that, although very well put together, will make you look rather unstable if you play while on the train/subway. You must direct a small spherical object around a maze while avoiding the obstacles, before dropping it in the designated gap. A lot of tilting, frustration and practice is needed before you finally find the hole, but, if you keep the faith, you’ll feel elated once you get it in. Wink. At $7.99, it’s rather steep, but, worth it for the hours of fun you could be having. We just couldn’t leave this one out of the list, we bring you a game first demoed by Apple at the official announcement at the Yerba Buena. 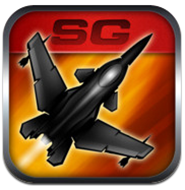 Created by a true veteran of the gamersphere in the form of Namco, this fun, addictive sky shooter provides a great alternative to the flurry of first-person shooters available at the App Store. Although it offers a campaign mode that’ll have you doing battle instead of being productive, the main appeal is – as usual – in the multiplayer experience, which is as smooth and streamlined as you could possibly imagine. It costs $4.99, and in our view, is well worth it. Lets face it, with deep integration of Twitter itself in iOS, there’s a very small chance that you’re left out from the 140 character party. And having been updated with Retina display graphics just this morning, it would be an unwise move not to install the official Twitter for iPad client on your shiny new Retina display oozing iPad. It would be unfair not to let those Tweets fly out in their Retina glory, agreed? First showcased back in October at the iPhone 4S announcement, it’s a game driven by jaw dropping and some serious whooping graphics. Having been updated with Retina graphics just for the new iPad, it’s a game which should sit on any iPad owner’s SpringBoard no matter what happens. For a price of $6.99, it might sound a bit too steep, but the graphics and gameplay which it has to offer, the price is more than justified. The space taken up by these new apps and games will undoubtedly have increased, meaning your 16GB flash memory may not be sufficient this time around. If you’ve yet to make the purchase of the new iPad, you may want to consider the 32GB model if you like to have a more than just a couple of apps and games on your SpringBoard.